Today (Friday): Building clouds, highs near 70 degrees. Overnight Friday Night: Clear and cool, lows in the 40s. Saturday: Period of clouds, breezy. Highs near 70 degrees. Sunday: Mostly cloudy, evening showers. Highs in the 70s. 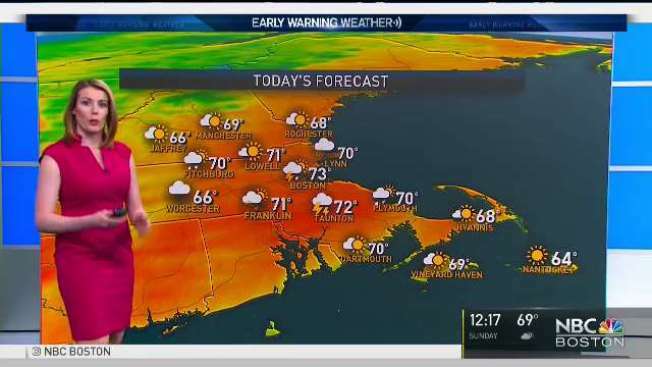 An area of low pressure traverses across New England today, bringing clouds and scattered showers and thunderstorms. While we’re not expecting any storms reaching severe criteria, some may carry small hail. Remember, when thunder roars, go indoors! Highs today won’t be as warm as yesterday, reaching either side of 70 degrees south, 60s north. Expecting a drying trend under clearing skies overnight as a cooler air mass moves in behind a cold frontal passage. Low temperatures will be slightly below normal for this time of year in the mid 40s. Another disturbance moves through on Saturday. This system will bringing more clouds and perhaps a few showers. Not expecting any widespread rains as an area of weak high pressure crests near New England. Highs reach into the low 70s south and mid to upper 60s north. 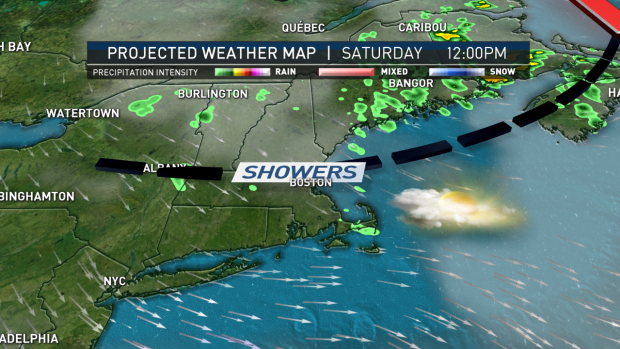 The next weather system approaches New England on Sunday, dragging a warm front north into the region by Sunday night. Overall, expecting building clouds followed by a chance of showers towards the evening. Highs in the low 70s south and mid to upper 60s north. Looking ahead to the start of the work week, low pressure spins over the region, resulting in cooler temperatures in the low 60s and rainy conditions as flow shifts to off of the cold Gulf of Maine. On Tuesday, continued cool and damp weather. Highs only reach into the upper 50s to low 60s across the region, nearly 20 degrees below the climatological norm for this time of year. Rainy and raw conditions continue right into the middle of the week as an upper-level low pressure rotates overhead.